In the days of yore, it was typical on weekends to catch sight of off-duty soldiers filing into the NAAFI Britannia Club for a bit of R&R: Beer-imbibing, playing billiards, lolling around poolside, shimmying on the dancefloor and indulging in more clubhouse's comforts. The heritage building was built in 1952 and had become a treasured architectural relic, serving as one of the fondest memories that was forged in Singapore. Several decades later, the beloved Britannia Club has finally metamorphosed into The NCO Club, a multi-concept destination that upholds the age-old purpose of being a social enclave for whoever that drops by. Exuding a colonial charm from its exterior, the building is strikingly grandiose inside with posh carpet floors, gleaming hardware fixtures, and commanding chandeliers hanging off from ceilings; even the waitstaff are clad in expensive-looking uniforms. The grandest of them all is perhaps the full-service restaurant concept called Madame Fan. Taking up almost the entire third floor, the 222-seater Chinese restaurant prides itself to be an ‘etiquette-free’ dining concept, which is a little ironic, seeing that the poshness of the venue certainly warrants a fancy dress code. 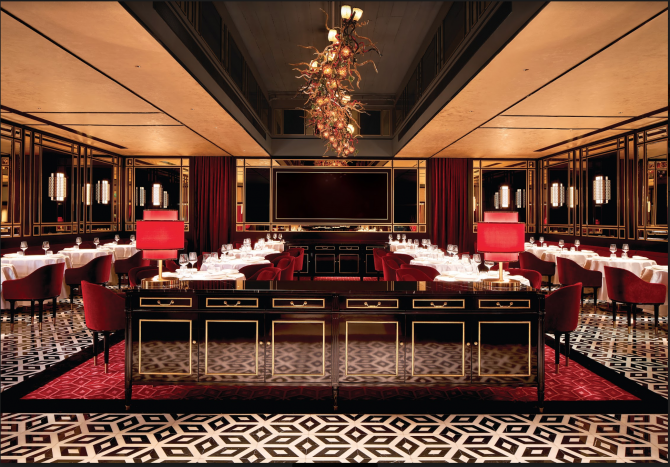 Reminiscent of old Shanghai glamour, Madame Fan’s main space is bedecked with velvet chairs and gleams with golden hues, further accentuated by shades of black and crimson red. A stage fronts the space, where jazz performances will take place. Beyond the main dining hall is a handful of private dining rooms for more intimate soirees. Food is decidedly Chinese with little modern tweaks here and there. Aside from a decent array of dim sum such as char siew bao, siew mai adorned with wolfberries and the uncommon Mooli Puff that wraps julienned turnips in flaky pastry, some culinary standouts are the drunken crab rice noodles and tart raspberry sabayon presented on a hazelnut crumble.